At a moment when we are facing an epidemic of incivility and hate—with divisive political speech, online trolling, and hate crimes escalating—popular CNN commentator Sally Kohn sets out to discover why we hate and how we can stop it. As a progressive commentator on Fox News and now CNN, Sally Kohn has made a career out of bridging intractable political differences, learning how to talk civilly to people whose views she disagrees with passionately. Famously “nice,” she even gave a TED Talk about what she termed emotional correctness. But these days, even Kohn has found herself wanting to breathe fire at her enemies. It was time, she decided, to look into the ugliness erupting all around us. 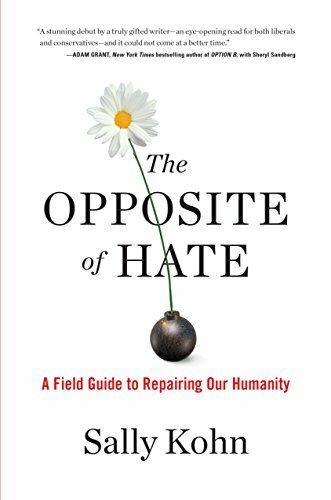 In The Opposite of Hate, Kohn talks to leading scientists and researchers, investigating the evolutionary and cultural roots of hate and how simple incivility can be a gateway to much worse. She travels to Rwanda, to the Middle East, and across the United States, introducing us to terrorists, white supremacists, and even some of her own Twitter trolls, drawing surprising lessons from these dramatic examples—including inspiring stories of those who left hate behind. As Kohn boldly confronts her own shameful moments, whether it’s the girl she bullied as a child or her own deep partisan resentment, she points the way toward change. No one is more poised to lead us out of this wilderness of hate than Sally Kohn. Her engaging, fascinating, and often funny book will open your eyes and your heart.